The already strained relationship between Unifor, the Canadian workers union, and General Motors has now turned to legal threats. Last week, General Motors, through its lawyers Gowling WLG, demanded Unifor to “cease and desist from any further publication (in any form and media whatsoever)” of a commercial the union had planned to air several times during the Canadian broadcast of Super Bowl LIII. The ad, called “GM leaves Canadians Out In the Cold,” is critical of GM and its plan to close Oshawa Assembly in Ontario. The union said it would disregard GM’s demand, according to the Detroit Free Press. GM also took issue with the ad’s use of language and how the commercial portrays the company’s $10.8 billion government bailout and the $300 cost per Canadian citizen. GM says the commercial makes it sound like there were two bailout packages—one from the government and one from citizens. “In other words, the Advertisement uses imprecise language to conflate concepts, confuse and mislead viewers and dramatically inflate in their minds the amount of assistance actually provided to GM,” the letter from Gowling to Unifor President Jerry Dias said. The commercial and responding legal letter are both the latest in an escalating battle between the two that started late last year when General Motors announced it wanted to close five North American factories as part of a company-wide restructuring. 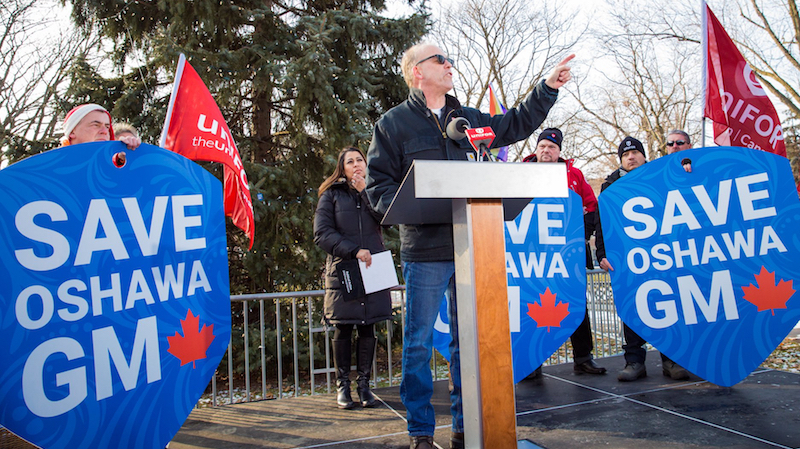 Unifor, unhappy with GM’s decision, began an aggressive campaign to save the factory. Unifor outright rejected GM’s plan to close the Oshawa plant; however, GM eventually rejected the union’s plan to keep the factory operating. Things have only escalated since. Oshawa employees have held sit-in protests, walked off the line, protested the automaker at the Detroit waterfront, and blocked access to GM’s Canadian headquarters. Unifor wants to bring GM back to the negotiating table, but the automaker is instead urging the union to begin assisting employee transfers to other GM facilities. And this isn’t the first media blitz from the union criticizing the automaker. Since GM made its announcement of a massive restricting that also called for laying off thousands while discontinuing several models such as the Buick LaCrosse and Chevrolet Impala, the union has bought ads on TV, in print, and on billboards as a way to get the attention of GM executives. However, since GM has rejected any plan to keep the factory open, the union has called for a boycott of Mexican-built GM vehicles—a boycott co-signed by the United Auto Workers union as the Detroit automaker became Mexico’s largest car maker. Unions are the worst and the auto unions are the biggest offenders. How is Unifor going to justify the legal costs that they’re going to pass down to the unemployed union workers for this slander campaign? I don’t find the language in that ad misleading at all, quite precise actually. Interesting argument for GM to make considering the real people not actors commercials many of which were proven to be false or misleading. Assistance or bailout or whatever you choose to call it aside, I tend to agree with the “why should we help you if you won’t help us” theme. the unions will not admit it was the unions that drove the auto companies to mexico with their work rules not their wages. Baloney! It was the ability to pay workers a small fraction of what middle class workers in the US and Canada were being paid. Ross Perot was right on the money in 1992 when he predicted NAFTA would result in a Giant Sucking Sound of the jobs flowing to a 3rd world economy! Not balony, it WAS a major factor, just like NAFTA. Well, sometimes the truth hurts. We feel the same in the US. GM Canada needs to notice how Holden slipped out of the top five in Australian auto brand sales last year. The same could happen in Canada. With CBC portraying Trump in the most negative way possible, like many other media outlets, along with a somewhat hostile end to NAFTA, Canadians do not have overly warm sentiments towards their southern neighbors at the moment. GM may become the focal point of these negative feelings and suffer sales declines similar to Australia. Maybe this is unfair but it could be perception that turns into reality. From my years of experience in the automotive industry, it appears UNIFOR is using typical but ineffective union tactics. If UNIFOR was competitive they would have jobs…. period. Don’t let any autoworker union tell you that they invented the middle class. The middle class existed long before there were cars, and will continue to exist when assembly jobs are fully automated. The problem is there is too much capacity in North America. And with very low tariffs, anyone can sell cars here. As more products come here, other products get squeezed. GM wants to eliminate the products that are being squeezed out of the market. It should not be GM’s duty to employ those or any people. I am a gm buyer and a life long gm enthusiast my grandfather worked his entire career for Oldsmobile in Lansing, and had a long time internet pen pal from very early instant messaging times who was also a life long Olds employee in Lansing. An employer of mine is married to the CEO/owner of a new GM dealership. GM has made some serious faux pa with its public image. Serious lack of quality in many product lines for nearly 20 full model years (Cadillac, a major offender) a blatant disconcern for rust belt consumers. Now if they close their flagship GM plants in North America in this fashion… they may as well just bring the Chinese Baojun here and sell it as a foreign car. I voted for trump so I can say he’s been an idiot. I bought a brand new GM product, and have never registered a non GM vehicle in my life so I can say I don’t care for GMs leadership at the present time and I don’t care for the image they’re generating for an impressionable generation of buyers. Gee if Unifor had worked with GM and cooperated they may have had a new product coming and they would be collecting the $10,000 bonus the UAW is. Some folks need to wake up and realize Unifor is who killed the jobs here with their behavior not GM. Also layoffs and plant closings are a part of assembly plants. I have worked a line and got laid off myself. In fact I got laid off because I got bumped by an older union member that was making $27 per hour screwing sweepers together. That was 25 years ago. I used the experience to learn and avoid union labor. I am not sure GM can do much here but I would thing GM should counter with a list of the problems Unifor has created over the year. Might note the UAW is much more quiet as are the CAW. They both are doing token complains but not much else. They know not to kill future jobs and they will cooperate in the future to gain more jobs back. They know GM is not going to move it all unless they are forced to. GM and the UAW have been working well and I think it will continue to serve boths interest. I don’t see why GM is mad about Unifor telling folks GM sent jobs to Mexico. They cannot be ashamed of their Mexican operations since they gave them preferential treatment with product allocation. It should tell you something if a non-unionized Mexican worker can put together a car equal to or better than a unionized Canadian or American worker can. I mean, auto assembly isn’t a specialized trade like construction contractor, and it isn’t something that requires specialized education to preform, so what exactly does the UAW and UNIFOR bring to the table that makes the final product better for the consumer? Surely it’s not in the forklift driver at the plant who earns $70K a year, or the moron in charge of changing lightbulbs and plugging in computers. Maybe the UAW and UNIFOR lost because they were straight up greedy, demanding too much pay for underskilled work. Also, jobs are ALWAYS temporary and subject to change. Smart people do jobs with the intent of getting out ASAP and onto a career, a profession, or a skilled trade. Dumb people stay in jobs for decades and build their lives around them. That’s why they call it a dead-end job. There are also plenty of “skilled” workers as you would call them doing engineering and IT in India and Mexico for $8 an hour. I’m sure not that many “smart” people in this country would be happy working for that wage. Professional associations (especially those governed by provincial mandates) demand that an Indian or Mexican engineer be certified to work by a professional standards body in Canada. The same exists in every other national jurisdiction the world over; you must meet qualification standards before you can even work or practice. This is especially true if the nature of the engineer’s work is inherently public in it’s application (civil, structural, material) at which point public liability requirements for both the work done and the insurance coverage must be proven to the satisfaction of the provincial governing body. What the engineer’s fee is determined by the firm through negotiation. Professionals aren’t paid by the hour, and I wouldn’t ask for the expertise of engineer who was, even if they were Indian or Mexican. Sadly however there are many many so called IT “engineers” in offshore locations who hold minimal or no certifications. At lower levels they are little more than bio-robots working of scripted procedures.